The cult classic The Hitchhiker’s Guide to the Galaxy by Douglas Adams is not just a story. It is a world created across media and time. This world is constantly being adapted and reinvented. Inspired by graphic design for cinema, I set out on a quest to discover how to build a world through graphic design. How could I make this world my own by creating a visual language and fabricating meaningful points of entry? I used Slime Mold to grow my own micro universe and to generate an organic visual language that would convey the context, feel, and emotion of the novel. I concentrated on creating a cohesive world with enough points of entry to be accessible even for those who are not familiar with the novel. The world I chose for my thesis is the world of The Hitchhikers Guide to the Galaxy by Douglas Adams. It is a world that spans over 8 Novels, a radio show, comic books, A movie and multiple stage shows, video games and LP adaptions. The novel itself has been translated into 38 languages. Adams himself was involved in many of these adaptions and reserved himself the liberty to change and adapt the story as he saw fit. Adams was not necessarily a good story teller but he was a really good world builder. Instead of creating a world around his stories he created stories that would fit into his world. “The Babel fish, is small, yellow and leech-like, and probably the oddest thing in the Universe. If you stick a Babel fish in our ear you can instantly understand anything said to you in any form of language. The speech patterns you actually hear decode the brainwave matrix which has been fed into your mind by your Babel fish. The Universal Times is a non-linear attempt at approaching the narrative through the context, the world of the novel. To communicate the feeling of movement I wanted to create a window into space. I used timelapses of Slime Mold to create the planets. 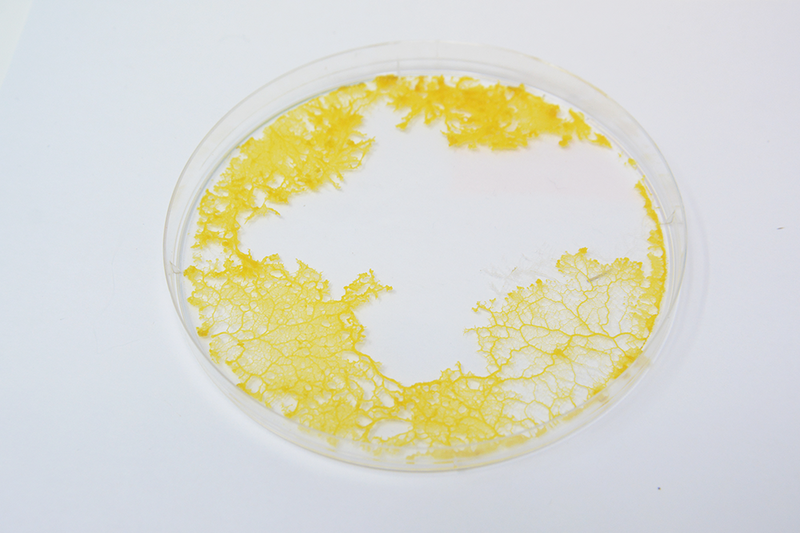 Many of the forms used to create the visual language I found in close-up photographs or in the movement of Slime Mold. I spent a lot of time experimenting with the Mold to solidify my approach. I wanted to create a language that is a perfect balance between weird and familiar. Once i started looking for forms, I couldn’t stop. I want to thank everyone who has helped me in any shape or form during this crazy journey. I especially want to thank Ellen, Jason, Jennifer and Lindsay for their expert guidance, Matty for being my left and right hand man, Aurora for always listening to me complain, Potch for teaching me his typographic wisdom, Hayeling for helping me to put it all together and the whole MICA GD MFA ‘18 class for sharing their ideas, values and constructive feedback.